After EA added vampires to the mix in 2010's Late Night expansion, The Sims 3's fans have been clamoring for a way to faithfully recreate scenes from the Twilight Saga without having to resort to user-created mods. The Sims 3 Supernatural heeds their moody metaphysical call. 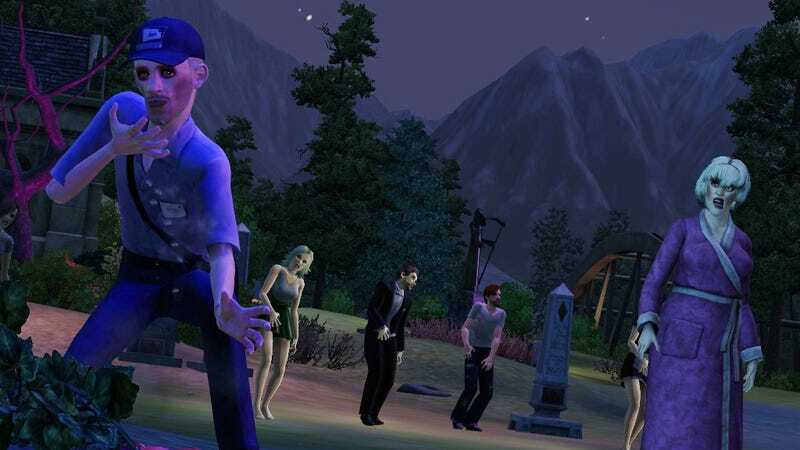 Due out in September, The Sims 3 Supernatural not only allows players to create werewolves and "more intriguing" vampires to act out their darkest Stephanie Meyer-inspired fantasies, they can create a zombie horde to destroy them when they come to their senses. The pack also adds fairies, which probably seem out-of-place thematically unless you're a fan of White Wolf role-playing games. Fairies can be total assholes. Oh, and there'll be mages (technically witches) as well, so we've pretty much got the entire World of Darkness stable in the tiny virtual house now. Supernatural sims will enjoy a wide range of unique powers, traits, skills and interactions, from zombies biting to vampires making every depressed with their poetry. Alchemy will allow sims to create magical elixirs with mysterious effects, enhancing or potentially ending their meaningless lives. And hey, if you preorder the Supernatural expansion pack you'll score a Plants vs. Zombies content pack, filled with classic PvZ attire and the iconic pea shooter. Aren't you glad EA bought Popcap?